About two months ago, I made a huge change in my life that brought me from the cold and frosty land of Canada directly into the heat and sun of lovely Dubai. Despite the glory of Dubai, I was not prepared for the heat. Unlike the comforts of home, Dubai’s high temperatures can make exercise a challenge. With high heat comes excessive sweat, leading to dehydration and an expedited loss of important vitamins and minerals, leaving you feeling low energy and lethargic. But that’s not all…not much grows in the desert! All my favorite fresh veggies and fruits that were such a big part of my diet at home are just not the same here. Sure, you can get salad, berries and plenty of veggies, but they seem to lack vitamins and minerals and are generally nutrient poor. Based on this, I knew it was time to get myself back on a good multi-vitamin pronto! So, when I got my hands on Advanced Molecular Labs Thermo Heat Multi, I was excited to give it a try and get back to feeling more like my energetic self again! AML’s Thermo Heat Multi helped me to feel more than a little better, I felt a lot better. Not only did I have more energy, I also felt a thermogenic boost to my metabolism and a reduction in my appetite. How Does Thermo Heat’s Multi Work? Multi-vitamins main function is to help fill the nutritional void where the diet falls short. If you workout regularly and lift hard, you are not only using up more nutrients to fuel metabolic processes – like converting the food you eat into useable energy – you’re also losing nutrients via sweat. Add a restrictive diet on top of that, and you could be suffering with nutritional deficiencies more than you know! 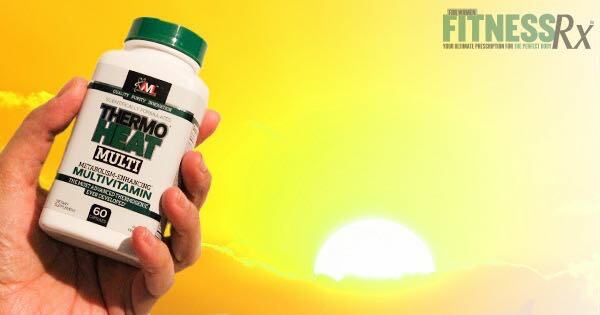 AML’s Thermo Heat Multi not only delivers a blend of vitamins and minerals that can help optimize metabolic function and wellness, it also provides essential nutrients for boosting thyroid function and, just like some of AML’s other products, contains the Thermo Heat Thermogenic Proprietary Blend that supports fat loss and a lean body. Optimize Health, Support Metabolism & Enhance Fat Loss! When it comes to a multi-vitamin, metabolism support and fat loss are not the first things I think of, but it certainly peaked my interest when I first picked up my bottle of Thermo Heat Multi. This multi-vitamin may just be the perfect multi-vitamin when it comes to a woman’s needs. It’s formulated with a blend of fat-soluble vitamins including: antioxidant vitamin A, metabolism-boosting vitamin D, vitamin K and vitamin E. It also includes important water-soluble vitamins: C and the energizing B-complex vitamins (including folic acid and vitamin B12). It also provides important minerals, including hormone-balancing zinc, muscle-supporting magnesium, blood sugar-balancing chromium and thyroid-supporting selenium! Unlike most multi-vitamins that are focused on squeezing as many vitamins and minerals as possible into their formulas, Thermo Heat Multi is focused on results—only using ingredients that have been proven to help enhance performance and help improve that body too. One of the main ingredients that supports those goals is Vitamin D, which has been shown to support not only your overall health, but may also help you get through a tough workout, improve muscle tone and support fat loss. Thermo Heat Multi delivers 4000 IU of Vitamin D3, the clinically researched dose shown to help you achieve results! One of the unique features of the Thermo Heat Multi is that it doesn’t provide you anything that you don’t need. Most multi-vitamins deliver a long list of nutrients and a hefty price tag, and you’re none the wiser because of it. Too much of anything is never good, that’s why you won’t see any iron, copper or manganese in Thermo Heat Multi! These nutrients are considered reactive minerals that can increase oxidative damage instead of prevent it. In addition to these minerals, you might also be surprised that Thermo Heat Multi doesn’t contain any calcium. At one time, calcium was considered essential for bone health, but recent research has shown that calcium is not as beneficial as once thought, and it may also have a negative impact on cardiovascular health! Instead of overwhelming your system with high doses of these nutrients, this multi only delivers what you need most! Besides the specific use of key vitamins and minerals for supporting metabolism, thyroid function and a lean body, Thermo Heat Multi also delivers the proprietary Thermo Heat blend that focuses on activating thermogenesis. The Thermo Heat proprietary blend contains ingredients that stimulate energy expenditure (capsaicinoids from cayenne peppers and Berberine) while also helping reduce appetite (BioPerine, cinnamon and gingerol). Thermo Heat’s proprietary blend also delivers ursolic acid, which helps to support BAT thermogenesis, which is the stimulation of brown adipose tissue or non-shivering thermogenesis, allowing energy to be dissipated as heat. This process encourages the use of fat as fuel. Thermo Heat Multi also delivers a wide range of antioxidant compounds such as oleuropein, kaempferol, curcumin, grape seed and red wine polyphenols that support health, fat loss and wellbeing and help to suppress oxidative stress. Not only did the Thermo Heat Multi make me feel more energetic, it also successfully suppressed my appetite and helped me feel at my best during my extra long days spent travelling around this concrete jungle. Yes, macro and micronutrients from foods are the best way to maintain health and fitness. However, when you can’t get everything you need from food alone, getting it from a scientifically sound multi that supports fat loss goals is a definite close second! Looking for a multi-vitamin that supports your performance and fat loss needs? Give AML’s Thermo Heat Multivitamin a try for yourself!